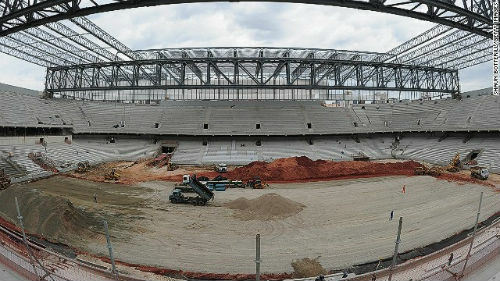 ▲ Itaquerao stadium which will host the championship's opener in Sao Paulo, Brazil is still under construction. There were two deaths in Brazil recently. One person, a British oil worker, was killed by two gunmen in Rio de Janeiro in an attempted carjacking as he returned home to his family after a business meeting. The other was a worker at the Itaquerao stadium, which will host the championship's opener in Sao Paulo. He got serious head injuries after falling from about 26 feet while helping to install temporary seats at the stadium and he did not survive. Those deaths suggest that Brazil has some problems to solve ahead of the 2014 FIFA World Cup as a host country. The first death suggests that Brazil has serious public security problems. To solve this, the government has dispatched more than 2,700 members of Brazil's security forces to Rio de Janeiro's most violent areas called favelas, a slum in Brazil, to crack down on drug gangs. Although favelas are found in urban areas throughout the country, many of the most famous ones exist in Rio. According to Brazilian police officials, for decades the area near Rio's International Airport was controlled by some of the city's most powerful drug gangs. The soldiers will temporarily replace police officers who have occupied the slums and will remain there until after the tournament. The second death is related to excessive spending and delays. It was the eighth World Cup-related death after a worker fell at the stadium which will host the championship's opener in Sao Paulo. Last November, a crane collapse at the stadium caused significant damage and killed three people. Stadium construction in Sao Paulo was already behind schedule due to the damage caused by the earlier accident. Brazil was required to have eight stadiums but they planned to construct 12 and devoted themselves to it. The plan has caused the cost of human lives. Moreover, two main stadiums in Porto Alegre and Sao Paulo are still under construction. Above all, one of the biggest problems is that only 48 percent of Brazilians support the nation's hosting of the World Cup in June. Mauricio Zotarelli (Senior, Dept. of Business Administration, University of Sao Paulo) said, "At a first look I thought it would be awesome, since we are the major football nation. But after seeing how the preparations have been going and how the stadiums are still under construction, I think that this is not the scenario I would have ever imagined─poor people being moved out from the places they have lived, huge investments in stadiums where professional football does not have too much appeal to Brazilians, and the deaths of people caused by hasty construction." Brazil is a soccer-crazed nation but what people want now is not soccer. They want to walk the streets at night without fear, to study in a better educational environment, to use much more convenient public transportation and have hospitals without long lines. Even if football gives pleasure to them, it is not worth a human beings life.